Bhu-mandala is one of many of the created universes in our cosmos. It is the egg/aura of that great creator being called Krishna. Bhu-mandala is composed of an upper(Heaven) and lower(Hell) half each containing seven planispheres, the middle or 15th of which is the flat plane we live on. These concentric spheres can be seen as ringlets across the flat middle plane alternately earth and water, much like Plato's Atlantis model. Each may also correspond to a particular planet or heavenly body. I have avoided listing the distances and sizes of the various components of Bhu-mandala because of the various contradicting sources and interpretations. At the very center of Bhu-mandala is the central landmass of Jambu-dvipa with Mount Meru as its axial center. 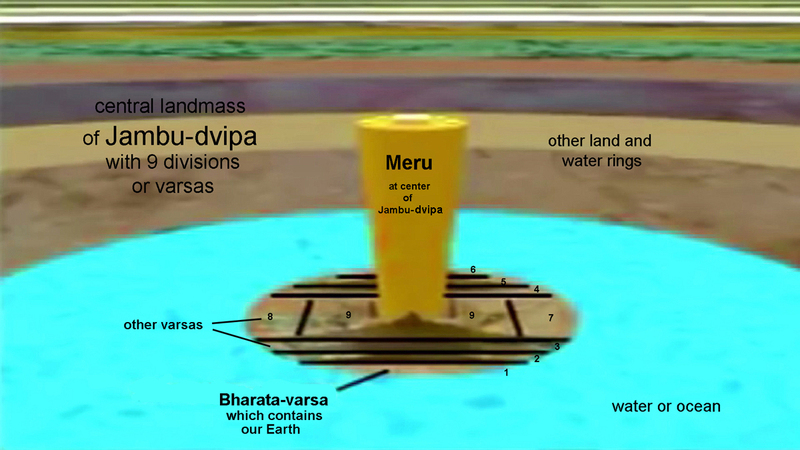 Jambu-dvipa is divided into nine sections or varsas, the southernmost of which contains our Earth plane. 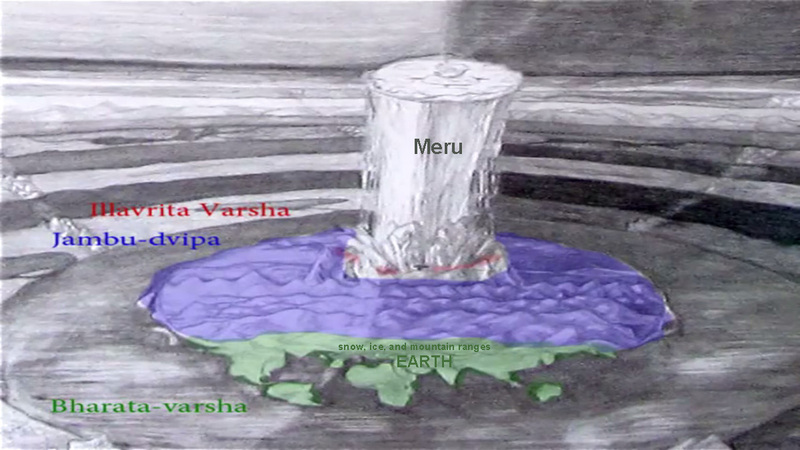 The top of Meru where the gods live is divided into four main sections and rivers and determines the the four cardinal directions of the universe. Meru is also the control center which guides the stars, planets, and luminaries. The southernmost section or division of Jambu-dvipa is Bharata where our Earth is located along with eight other worlds like it. These nine "Earth's" are just off the mainland in an east-west direction and surrounded by water or ice. Farther away are other Earths or "puddle" landmasses. An alternative interpretation is that the ENTIRETY of Bharata-varsa is the Earth strewn along east to west and north/south with its various continents. WaykiWayki is inclined towards the nine Earths model of Bharata but doesn't appear to be one-hundred percent certain. There is even another interpretation that says Bharata-varsa is simply Greater India which contains nations around it like Pakistan, Afghanistan, Nepal, Bhutan, Bangladesh, southwest China, and much of southeast Asia down into Indonesia. If this is so, then the other landmasses or continents(varsa means "continent") must be represented by the other 8 varsas, making Earth the entirety of Jambudvipa. So which is it? Is Earth one of the 9 "islands" off Bharata-varsa's coast? 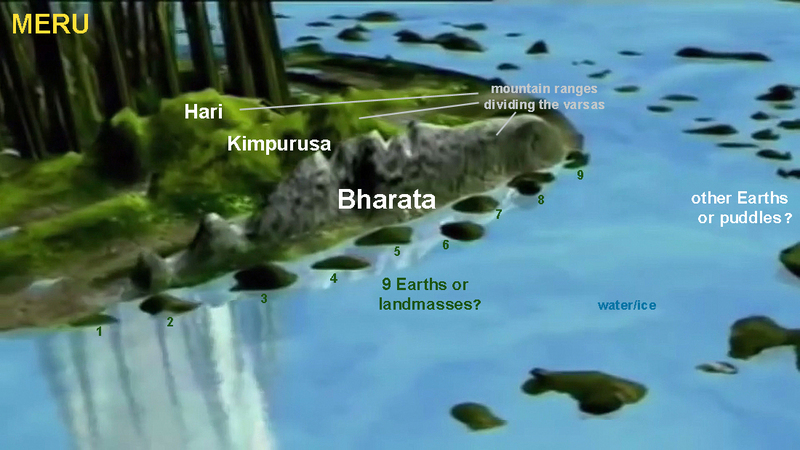 Is Earth Bharata-varsa? Or is Earth Jambudvipa? This is very confusing, unless Earth can be represented in three octaves -minor, median, and major. 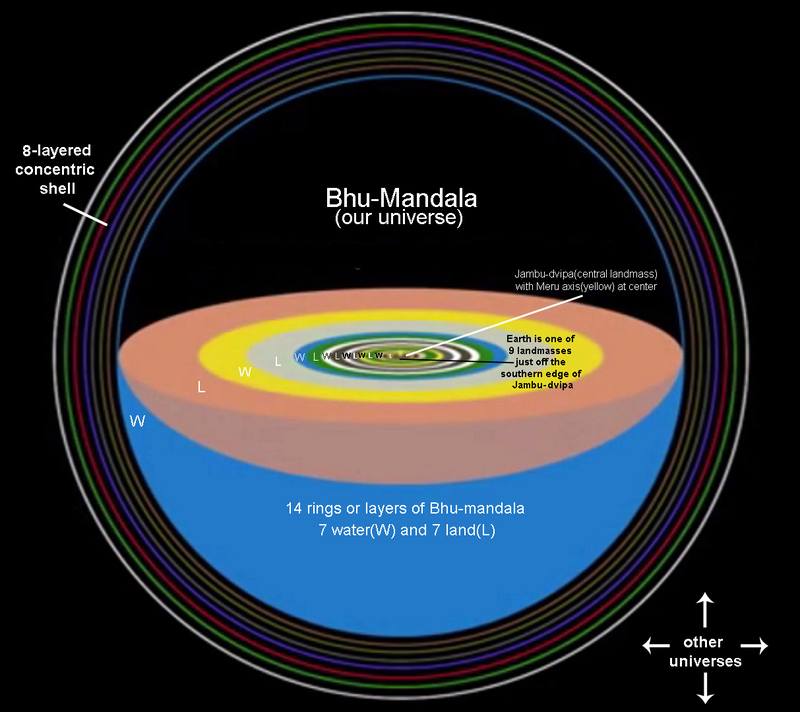 What we term "Earth" may even extend(as Greater Earth) throughout the entirety of the Bhumandala plane. In any case, his six months' journey and work in India has brought forth much fruit in our understanding of Vedic cosmology and Earth's place in it, and I highly recommend his articles and videos.